CONTEXT: OBSERVATIONS FROM MY GARDEN #4 When Is a Flower a Weed? Several years ago I decided to disguise the cyclone fence surrounding my vegetable garden by planting morning glories that would vine on it. I planted the seeds, and they sprouted, and they grew, and the vines did, indeed, cover the ugly fence, and the flowers greeted me every morning that summer. And the next. And the next. And the next. Morning glories are persistent. But then two summers ago, I put in the bed of zinnias in front of the fence. The morning glories did not get the memo that their services were no longer needed. They again sprouted, multiplied, put out tendrils that wrapped around anything they touched, and grew many inches a day. They cheerfully invaded the whole flower bed of zinnias. Every skinny horizontal stem visible in the photo is a morning glory vine–zinnia stems are thick and vertical. The tendrils and leaves are even the same color as the zinnias, and make the plants appear, at first glance, to be lush and healthy. But the morning glory vines’ weight eventually bends the tall stems of the zinnias and pulls them to the ground. Sometimes habits start out as good, purposeful, under control, and initiated with the best intentions, like my morning glories. But when we become more mature, more intentional, and ready to move on, their seeds are still there, buried in the ground of our mind and heart, and they sprout and grow, and their pretty, once-welcome, innocent-looking tendrils wiggle their way right into the new life we lead and pull us down. We need to search for them daily and pull them out. Yes, they’re beautiful flowers, but if they destroy better things in our lives, they need to treated like weeds and be banished to the compost pile. This entry was posted in Blog on August 24, 2016 by lrmayfield. I strongly believe that virtually everything we perceive is affected by its context, and we ignore that at our own peril. But being aware of our context does not mean allowing it to dictate our actions or responses. Recently I’ve been wondering if we allow our context to dictate how we pray. I did an intensive study of prayer a few years ago: I read books by men and women of widely different times and theological backgrounds, and the Old and New Testaments. Jesus’ instructions and models are in the Gospels, and the Epistles contain a surprising numbers of Paul’s prayers. The biggest surprise was not what I found, but what I didn’t find: I found no mention of group prayer! Kings prayed in front of Israel on behalf of Israel, but the king alone was praying. When Samuel saw Hannah praying in public, he assumed she was drunk, so he obviously wasn’t used to seeing public prayer. Jesus often went off alone to pray, and sometimes he took his disciples, then asked them to wait and WATCH (not pray) while he went on alone. After trekking with him daily for three years, they asked him to teach them to pray. They obviously hadn’t been doing it together, or they would have known how. When he gave them specific instructions about how to pray, he told them to go in a room and close the door and pray “in secret,” and assured them that their Father would hear them. Wow! That’s a lot different from the seminary class I heard about in which students were taught to “preach in their prayers”! So instead of really, personally talking to God, the future pastors were taught to say what they wanted their listeners to hear, and just pretend they’re talking to God? Pretend that God needs to be reminded of the three-point outline of the sermon just preached? Or the meeting someone forgot to mention earlier in the service? Last Sunday our pastor warned us against “performance religion.” I’m wondering if we’ve become accustomed to “performance prayer.” Soul-searching time, here. This entry was posted in Blog on August 19, 2016 by lrmayfield. Earlier this year I read a book about the different “love languages.” My dear husband and I had already been married 47 years, lived on two continents, and raised four wonderful children to godly, productive adulthoods, but I learned a lot and had one HUGE “Aha!” moment. My dominant love languages are words and touch. Gifts came last. I had never thought about it before, but once I did, I realized I wasn’t surprised. I talk more than people like to listen, and the words that can’t come out of my mouth come out through my fingers to a keyboard. I’ll take a good hug anytime. I get more pleasure from finding and giving gifts than receiving them. Now, my Brian is a quiet man. He always has been, but now because of a medical issue, he’s even quieter and more solitary than ever before. I knew that words are NOT his love language! 😀 But then I thought about the gifts he has given me over the years, without words, and saw them in a whole new way. If I were a betting woman, I’d bet his first love language is gifts. The rest of this post is from my FB post today–but here, I wanted to put it into context. One afternoon in March Brian took his tractor and me down the creek at the farm to clear some logs. I spotted a huge boulder in the south/east bank and commented in passing that I’d love to have it in my new rock and shade garden. A couple months later Brian came home one night with very badly injured fingers. Whatever happened??? He had been using tractor, truck, and chains to get that boulder for me and it crushed his fingers. But it was here in the city, in the back of his truck, and he wanted me to decide where I wanted it. A few days ago he brought his tractor into town on a flatbed trailer, and this morning he used it to place that boulder and another one exactly where I wanted them–exactly. Today is our 48th wedding anniversary, and the rock he gave me isn’t a diamond on my finger, but it sure is a gift that says “I still love you,” isn’t it? This entry was posted in Blog on July 19, 2016 by lrmayfield. 7/14/16 I photographed my calendar and wrote this blog post the second week of May, and set it aside to wait to see how I should end it– which totally depended upon someone else, and now I know. In the winter of 1838-39, the 600 or so citizens (records differ) of Quincy and/or Adams County, Illinois, took in 5000 Mormons who had been expelled from Missouri by Executive Order of the Governor. When I learned that a publisher was buying books for a series for adolescent girls in which something historic happened in a specific place and year, I wanted to write about that. So began a decade of fascinating research on the beginnings of Mormonism. I finished the book, only to be informed that the last book in the series had just been purchased. So I used my research to write another one. A publisher and an agent have seen the first few chapters of it, and said they loved it; but one was afraid it might be too controversial, and the other wants me to develop a “platform” for my writing before she will represent it. Last week another extended an invitation to submit a full proposal for it with a complete manuscript. I had written, and rewritten, and rewritten again, and saved each edition of each chapter in Word files, but I had never before put all 30 chapters together into a whole book. Last week I edited each one word-by-word and saved them in one gigantic file, and Saturday night I submitted it. I feel like I’ve been grieving ever since. Isn’t that peculiar? Maybe not. The research and writing occupied most of my discretionary time for a decade, and now it’s done. The end of the process is a really good thing–I completed it! But suddenly not having the motivation and the reason to write THAT book feels like a gigantic loss of direction in my life. Many agents and publishers issue the caveat that a writer should wait 60 or 90 days to receive a response, and if none has come by then, the agent isn’t interested. The author doesn’t know if the agent ever saw it, saw it and can’t decide, or loved it and is taking it forward for purchase. 7/14/16 Now 60 days have passed, and I never heard back. This entry was posted in Blog on July 14, 2016 by lrmayfield. I could hardly wait to see how my gardens were going to look when we returned from a trip to Minnesota. The vegetable garden on the east side of the 4′ high woven metal fence was doing great–tomatoes, peppers, and several kinds of greens for salads were all small, but thriving. Squash plants were pushing through the ground. Many of the 90 onion sets had begun to grow a little. That done, just a day or two before we left, I had planted a whole garden of zinnia seeds on the east side of the fence, and watered it well. The packets said they would germinate in 10-12 days. Then we left. My last two posts have been about the sorry showing of zinnias–only a few here and there, and more weeds than flowers. None of the ones in the flower bed were more than about 4″ high, and certainly none of them was boasting a bloom. The weeds had to go. But about 5′ over, on the east side of the fence, smack dab in the middle of a row of onions, was a lovely, tall, robustly healthy, BLOOMING zinnia! I certainly didn’t plant one there, and zinnias are annuals, so a seed should not have survived over the winter out there. Where did it come from? I don’t know. I tackled the unwanted weeds. The salad garden was beautiful–a row of leaf lettuce, a row of mixed greens with kale, a row of Bibb, a row of black seed. Cauliflower and broccoli. Quite a variety! But there were some strangers in the rows, too–volunteer tomato plants that had sprouted from unharvested fruit last year. I’m very sympathetic to volunteers in any context, so I let them grow. Now they have virtually taken over the salad garden. 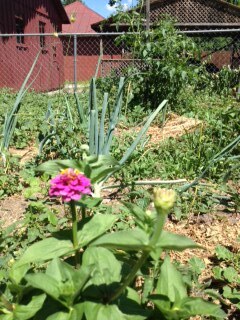 So is my blooming zinnia in the onion row a weed? Are the tomato plants in the lettuce bed weeds? Nope. They are good things–a zinnia and tomato plants–in unusual places. I must make the choices about them, like in the rest of my life. Sometimes something is fine when it is where it is expected to be, and fits in properly. There’s nothing jarring about its presence. Habits, things we believe, even friends are like that. But that same something might be quite surprising and appear completely out of place and inappropriate in an unexpected setting. Does that made it a “weed”? I don’t think so. Just like in my garden, it’s up to me to make choices. I have the responsibility to tend the “garden,” whether it is composed of dirt or life. 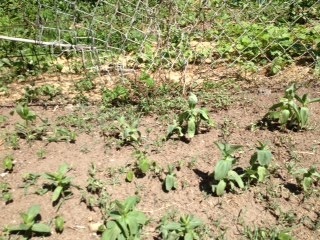 This summer, I appreciate the beauty of the zinnia blooming in the onion row more than I value having a “perfect” row. And I’m looking forward to harvesting unexpected tomatoes from where they volunteered to grow long after the summer heat has made the lettuces too bitter to eat. There will be more to share than I even planned! Next year, however, I may opt for symmetry, beauty, and only intentionally planted flowers and veggies. I need to be willing to make the choices for my garden and my life, and accept that what’s best for me and for my garden this June might be quite different next June–and that will be just fine. God put some spontaneity in nature to remind us not to get too set in our ways. This entry was posted in Blog on June 28, 2016 by lrmayfield. This flower bed that should have had four rows of three different varieties of baby zinnia plants poking their heads through the ground when I returned from our trip…didn’t. More than half of the vegetation was weeds, the few little zinnia sprouts were struggling, and the ground was as dry as sand. You may recall from Observation #1 that the only thriving zinnia was in the onions, in the vegetable garden on the other side of the fence. Sometimes when we’re floundering a little, we need to figure out which things are the flowers in our lives and which things are the weeds. Then we need to get rid of the weeds, even if they appear to be bigger, stronger, and more attractive than those timid little flowers that aren’t even big enough to bloom yet. They may be just filling up space now, but they will take over if left unattended. Encourage the flowers with some good role models and lots of water of the Word, and the sunshine of care and attention. It might not be long at all before those flowers are just reaching toward heaven on their own, and popping out new leaves and buds all over the place! Please Like if you like, and please reply. Can you think of any weeds you’re tempted tolerate in YOUR garden? Who is your “flowering example” that encourages you to bloom? 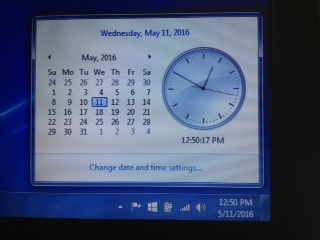 This entry was posted in Blog on June 18, 2016 by lrmayfield. I haven’t posted to this site for weeks, because my computer crashed and took down with it my wifi, dedicated external hard drives, and network. I tried to fix it, and so did experts, and whenever I just couldn’t deal with it anymore, I gardened: I planted 90 onion sets, rows of four kinds of peppers, two kinds of tomatoes, yellow squash, zucchini, five kinds of herbs, strawberries; a bodacious salad garden of three kinds of lettuce, four kinds of greens, cauliflower and broccoli; and a flower garden of three different heights of zinnias, just like the one that was so spectacular all along the fence last year. Planting two gardens full of so much promise was very hopeful and therapeutic. Then my husband and I needed to take a trip 600 miles from home for a week. Back home the rains had come and the sun was hot, and I just knew my garden was thriving. Then we had car trouble and our return was delayed almost another week. In June. When the sun is hot and the rains come. When we got back home, my gardens were lush and green, but only because one particular weed had virtually carpeted them both and grown to about 18″ tall. I had to part paths in the vegetation to find the squash and zucchini plants that had emerged from the seeds I had planted. The shade-loving lettuce was thriving under the umbrellas the weeds formed. The zinnias? Not so much (See photo above). From hundreds of seeds, there were only a few spindly little sprouts a few inches tall. But when I started clearing those weeds from around the rows of onions down the middle of my vegetable garden, look what was there–one perfect, fully grown zinnia, blooming like crazy! overrun by things that are undesirable and out of our control. The exact plan we had anticipated so eagerly is overwhelmed, overruled, dwarfed, minimized, or even dead. Maybe God just intended for that particular dream to be planted and growing all by itself, in a little different setting with others not one bit like itself, where it can really shine, like my zinnia in the row of onions. He can do that. Sometimes we just have to leave things alone for a little while and allow ourselves to be pleasantly surprised. This entry was posted in Blog on June 15, 2016 by lrmayfield.